Feeling like human being? Sounds kind of boring—we can fix that. After all, you get to be a human being every day. The human experience is great, but why not break out of the routine for a day? Why not try out something a little more interesting? Yeah, maybe it's time to give being a "monster" a shot. It's pretty easy! Just learn how to do a vicious snarl and start wearing these freaky looking monster hands! Then, your journey to becoming a monster for a day will begin. 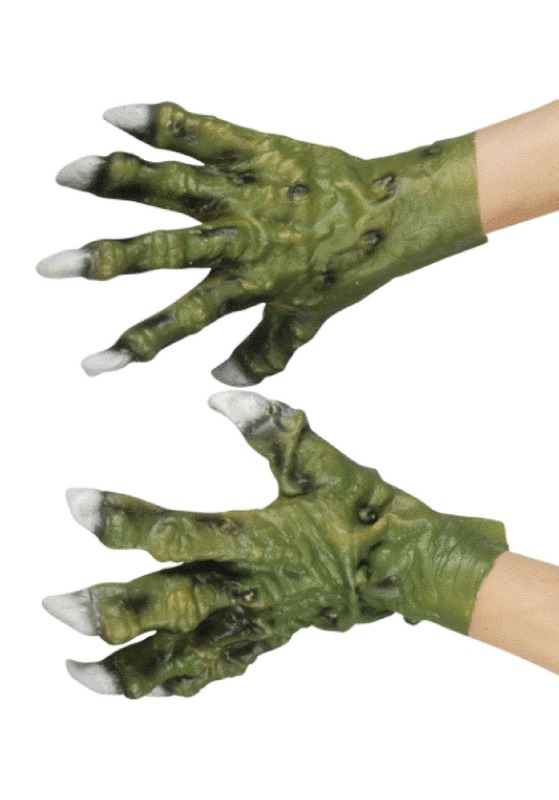 These Monster Hands a creepy way to transform your hands into hideous monster claws! They're made out of green latex and have an almost lizard-like appearance to them. They even have molded claws on the end of each finger. They fit like standard gloves, so all you have to do is slip them on to start feeling monstrous. Use them to finish off your monster or dragon costume! You have 365 days a year to feel like a human! At least for Halloween, it's time to give yourself a monstrous makeover to freak out your friends. These monster gloves are a great place to start your transformation!